A highly unusual and wonderfully light converted coach house. The original building was recently remodelled and given a new life by the owners and the property sits at the far end of their Aldbourne Road garden. The property offers a completely independent detached home over two floors with three bedrooms and spacious central kitchen / reception space; quiet outside areas and gated off street parking and it could suit a wide variety of needs. Not least live / work space or could suit those needing an additional loft bedroom for young children or guests. A real one-off. Askham Road runs north off Uxbridge Road into Aldbourne Road and is east of Askew Road. Wormholt Park and the Ark Conway Academy Primary School are close by and Westfield / Shepherd's Bush tubes are within easy reach, as is the East Acton Central Line tube station. 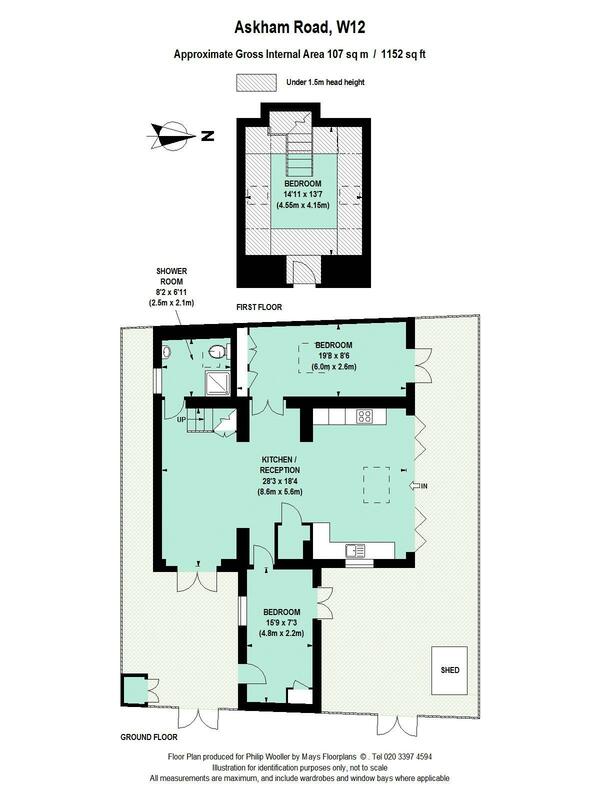 1152 sq ft / 107 sq m approx.